If you don’t know what to do with yourself on your day off of work on Monday, why not participate in the Mayor’s next Healthy Hometown event, the Hike, Bike & Paddle? You can ride your bike 15k then walk 5k and canoe or kayak 3k. I have to say, out of all the triathlon type events around town, this one does sound the most appealing to me. The Hike Bike & Paddle is open to athletes of any level, families, and even dog walkers. If you are interested in participating there are some things you need to know. Participants need to meet at the Great Lawn at the Waterfront by the dancing fountains. The walk starts at 10:00am but there are plenty of warm-up opportunities earlier in the morning. Starting at 8:00am there will be yoga warm-ups on the Waterfront with Taylor MacFarlane of Sunnyside Yoga. Also at 8:00am there will be Tai Chi, Breathing and QiGong Exercises, a Zumba Demo, a hot yoga demo, and an Ashtanga Slow Flow Standing Series with Krist Fulkerson, the owner of Yoga on Baxter. From 8:45am-9:20am they will be offering an Anusara Cool Down class, various classes of Venu Vanaparthy including eye exercises and meditation, Thai Chi, Laugh Yoga, and Fierce Fitness. I would suggest even if you don’t want to participate in the race, to come out early and take advantage of all the free classes! There are some unique classes that I have never heard about, including laughter yoga! The hike portion of the walk will start at Waterfront Park and go East toward Beargrass Creek and back to Waterfront Park. Because it is not a race there is a longer option available. You can download both maps on the walk’s website. The bike portion of the race takes you down into the West side of Louisville to 31st Street, with turn around options available. There are seven water stops along the bike portion and it ends back at the Waterfront. The paddle portion begins at Harbor Point at the Waterfront. Boats will be dropped off at 7:30am at the Green parking lot, which is located underneath I-64 at Whitherspoon. Canoes and kayaks will be available to rent from River City Canoe and Kayak. You can find more information on boat rental by calling them at 502-384-3737. The paddle portion will take you through Beargrass Creek, which as Louisvillians know, is not always the cleanest waterway. Pay attention to the Green, Yellow, and Red rating the authorities give the creek that day and take the proper precautions. Metro Louisville’s website gives a safety checklist to look at before you go out on the water, you may want to check it out. Monday’s Healthy Hometown event is going to be a lot of fun for the whole family. It’s going to be a no pressure, outdoor adventure, so take advantage of it! For more information on the event go to the Metro Louisville’s Hike, Bike, & Paddle website at: http://www.louisvilleky.gov/HealthyHometown/HikeandBikeMHHM/. Well it’s Labor Day weekend in Louisville again and that means some exciting celebratory festivals! Two festivals will be going on simultaneously this weekend and both will be offering Louisville’s music and culinary communities something unique to get them going. The Kentucky Bluegrass Music and Burgoo Festival will be held at the Water Tower while WorldFest 2012 is taking over the Belvedere. Both festivals will be offering music, food, and plenty of cultural entertainment that is sure to be high energy and lots of fun. Burgoo, is a traditional Western Kentucky stew that is relatively unknown outside of Kentucky. Most burgoo recipes have been handed down through generations of family members and are often kept secret within the family. The most traditional burgoo recipes consist of varmint meat, such as squirrel, possum, or weasel, whatever is available to the cook at the time. Today, most burgoo recipes you will find will be made with chicken or other fowl. Burgoo is a popular meal for impoverished areas of Kentucky, largely because of it’s cheap cost to make. Burgoo is usually made by the gallons, feeding many people in a family or a community for a small amount of money. Some towns in Kentucky have special machines to churn their burgoo and appointed burgoo chefs in charge of cooking it. Burgoo is taken very seriously in many parts of Kentucky and is often challenged in Burgoo contests. The 7th annual Kentucky Bluegrass Music and Burgoo Festival will give you a chance to try some delicious burgoo made from local BBQ joints like Frankfort Avenue Beer Depot and some out of town guests like Tony’s Barbeque of Lawrenceburg. Traditional barbeque fare, such as pulled pork and BBQ ribs, will also be served along with customary festival foods. The music at this year’s festival is going to be bigger and better than any year before. The band Russell Moore & IIIrd Tyme Out, winners of three International Bluegrass Music Awards, will be headlining the festival. Ten other bands will be playing throughout the festival including Newfound Road, Hog Operation, Hickory & Friends, and local favorite, Whiskey Bent Valley Boys. WorldFest 2012 will also be going on across town at the Belvedere. WordFest is a celebration of Louisville’s cultural diversity. The three day festival will offer food, music, dance, art and much more cultural education from a variety of countries. There will be three stages set up with performances ongoing throughout the festival. Native cuisines will be represented from all over the World. Be ready to sample plenty of new foods, like those from Germany, Ethiopia, Jamaica, and Thailand. On Sunday, the second day of the festival, there will be a Parade of the Cultures, where you can see representatives from nearly every country. Music, dance, clothing, and other artists from the countries will be part of the parade. There are a variety of opportunities for children to participate in activities and learn about the various cultures throughout the weekend. WorldFest is going to be a great event! http://kentuckybluegrassfestival.com/ for the Kentucky Bluegrass and Music Festival. If you love bourbon or are just looking for something fun to do this Friday night, look no further, the Frankfort Avenue Trolley Hop is going to be a blast. Not only is the trolley hop always filled with good deals, amazing art, and endless entertainment, but this month’s hop has a special twist. This FAT Friday is adding a “Red Headed Pub Crawl” to the night, a Makers Mark themed crawl complete with free red wigs. In addition to the normal stops on the FAT Friday roster, this Friday will feature special Makers Mark drink specials at bars and restaurants along Frankfort Avenue, but there is a catch. The only participants eligible for the specials must be wearing the red wigs that will be available at the 12 participating businesses along the hop. In addition to the excellent businesses that are normally part of the trolley hop and the restaurants and bars participating in the Makers Mark drink specials, there will be some unique opportunities for you bourbon enthusiasts to take part in. The Comfy Cow will host retired President of Makers Mark, Bill Samuels Jr., for a ceremonial dipping of a waffle cone in red chocolate. The event is scheduled to start at 6pm at the Comfy Cow which is located at 2221 Frankfort Ave.
You can follow Samuels after the dipping, to the Wine Rack, where he will be signing bottles of Makers Mark and Makers 46. The Wine Rack will also be hosting tastings of both Makers Mark and Makers 46 along with different cheeses. The bourbon tastings are scheduled for 6pm- 8pm and Bill Samuels Jr. is scheduled to be signing bottles from 6:30pm-8pm. The Wine Rack is located at 2632 Frankfort Ave. If you are looking for something a little more family friendly, don’t worry, there are plenty of options. Margaret’s Consignment will have live entertainment and offer a 10% discount on red items in the store. Margaret’s Consignment is located at 2700 Frankfort Ave.
Third Lutheran Church is going to have tons of stuff for the kids. The church is hosting a “Back to School Bash” complete with a bouncy house, junk food, and games and special guest entertainment, “Fermata NoWhere” Adeline Quartet is set to perform. The celebration is set for 6pm- 8pm at 1864 Frankfort Ave. This Friday’s Trolley Hop is going to be exceptionally fun. It is a great chance to support your local businesses while having an amazing time. You can pick up your red wigs at Work the Metal, Eyedia, A Readers Corner Bookstore, Just Creations, Peacock Boutique, Urban Farmhouse, Elizabeth’s Timeless Attire, Sister Dragonfly, Margaret’s Consignment, Crescent Hill Trading, and Bayly Boutique. For more information on where you can get on a trolley or any other questions on the FAT Friday Trolley Hop, go to www.fatfridayhop.org. Search all Louisville Real Estate for sale by area, price, year built, square footage or any other detail on Louisville's easiest to use MLS search engine. Listen up Louisvillians, there’s an app for your smart phone that you need to know about. If you haven’t added “Louisville Lush” to your list of go to apps, hurry up and download it now. Louisville Lush is free and offers a one stop location identifying all the best deals on food and drinks around town. With so many excellent restaurants and bars in Louisville, it is often hard to decide where to go to dinner or grab drinks. This relatively new app makes decision making a little easier, because now you can limit your options by seeing who is offering the best deals that night. The app uses your location to centralize the restaurants around you. On the front page of the app you see the three main categories that the app is broken down into; “Happening Now,” “Later this week,” and “Neighborhood." At any point in the day you can click on the “Happening Now” section and see deals going on. I found three restaurants at 10:30am offering food and beverage deals. This section came in handy just the other night when my friends and I were trying to decide where to go for dinner and drinks. We looked up what deals were going on and found that Dragon Kings Daughter was offering $3.00 off bottles of wine. It ended up being perfect. 60 West Bistro in St. Matthews is having half priced bottles of wine. Makers Mark Bourbon House Downtown is offering $5.00 select bourbon, cosmos, and desserts, and $5.00 off all entrees. Boombozz Pizza in Clifton is offering half priced appetizers, $1.99 bottles of beer, and $2.99 draft beers. Havana Rumba in St. Matthews is offering $1.00 off all sandwiches. The Back Door in the Highlands is offering $2.50 wells, $6.50/ domestic pitcher and $2.50/ domestic pints, Imports are $1 off a pitcher and $0.75 pints. Louisville Lush’s third section for searching the great deals around town is by “neighborhood.” This is a great way to see all the restaurants in a particular area that offer deals any day of the week. If you need to save a few bucks and want to know how to dine on the cheap, or if you just want to be at the hippest happy hours, Louisville Lush is what you need to stay in the loop. Everyone loves a good dollar beer and half priced wine night, so why not be in the know of who is given up the goods? Be Prepared For the Zombies! This year I am going to be prepared for the zombies! If you live in the Highlands you know what I’m talking about, and if you are going to be anywhere near the Highlands this Wednesday night, you are going to be thankful that you read this blog before you traveled to the area. It seems like every year I either forgot about the Zombie Walk, or I didn’t know it existed. I always end up driving in my car, staring at someone in a zombie costume, shocked, scared, or legitimately freaked out staring at someone walking in my neighborhood with blood running out of their mouth. This Wednesday night at 8:29 will mark this years Zombie Attack Walk and I suggest you be prepared. Bardstown Road and the Highlands will be filled with people dressed up in “Night of the Living Dead” wears. Their goal? To stop traffic, create chaos and freak out as many passerbys as possible. This year’s walk is hoping to be bigger and better than ever. Walk creators John King, Mike Welch, and Lyndi Lou started the Walk as a birthday celebration and never dreamed that it would have picked up the popularity that it has. Now a hipster Summer staple event in Louisville, they hope to break the World record for the largest zombie walk in the world. This year’s walk will be longer than ever before. The walk will start at Mid City Mall at the traditional time of 8:29 on 8/29. There will be a pre-party at the Back Door Bar and Grille beginning at 8:00pm. This year, the walk has a new end point, the Monkey Wrench. The Monkey Wrench will be hosting a huge party with live entertainment, awards, drinks and more. The Va Va Vixens, Squeezebot, OK Zombie, and other artists will perform. Lots of awards will be given out too for the best zombie costumes. The hottest zombie award, grossest zombie award, king and queen zombie awards and the golden machete awards will be handed out at the Monkey Wrench at 10:30pm, so make sure you put some thought in to your zombie costumes. If dressing up like a zombie is not your thing, you may want to go out on Bardstown Road and check out all the chaos. Free tee shirts and other giveaways will be handed out and the sights are sure to be entertaining. The Zombie Attack Walk is just one of those unique things that makes Louisville the great city that it is. I have to admit, it might be a little obnoxious for a few hours Wednesday night to have to deal with my two-year-old son freaking out every time a zombie walks in front of our house, but I guess that’s just part of the beauty of living in the Highlands. I know many people have mixed views on the Zombie Walk, but the way I see it is that it’s great that we live in a city where artists and fans can express themselves publicly, and for those who disagree, well its only for one night, so deal with it. Search for Highlands Homes for Sale 24/7 on Louisville's superior MLS search engine. The Highlands is a neighborhood that appeals to the lover of the outdoors. Whether you prefer to read your book on the porch or would rather let your kids play in the back yard than inside, the Highlands neighborhood is the right community for you. With several public parks close by including the renowned Cherokee Park in the Highlands center, there are plenty of opportunities to get out and enjoy the Kentucky air. Cherokee Park was designed by Frederick Law Olmsted, and encompasses 409 acres of beautiful land which includes a 2.4 mile loop for dog walking, running, or biking. Cherokee Park also offers a golf course, playgrounds, recreation areas, mountain bike trails, and some of the best sledding in town! I recently moved to the Highlands and have absolutely loved every second of life in this urban neighborhood. One of my favorite things about the Highlands that I didn’t know about before I became a resident is “Front Porch Tuesdays.” This program was created in 2005 by Tom Owen to help bring communities in District 8 together. Usually for two weeks in May, one Tuesday the odd number streets will have the even houses over, and the following week they will switch. Neighbors are encouraged to meet and mingle. My street, like many others in the Highlands has taken Front Porch Tuesdays to another level, making it a weekly, or bi-weekly event during the warm months of the year. It is really just an excuse for the adults to get together and have a few glasses of wine and lettting all of the neighborhood kids run around in the yard and tire themselves out just in time for bed. Not only do we look forward to these Tuesday nights because they are a great time, but they give us a chance to have mini neighborhood meetings. We make sure nothing has happened crime wise on the block, and it is always a good idea to keep in touch with our neighbors. Moving in to a new house and not knowing anyone in the neighborhood, Front Porch Tuesday was an amazing way for our family to quickly bond with the neighbors. We were able to meet everyone in our community, in a relaxed setting, and because Front Porch Tuesdays are frequent on our street, we were able to see them often. This was an unbelievable introduction to our new neighborhood. Without Front Porch Tuesdays, we would never know what great neighbors we have and would not have the many great memories that we have already made in the short time we have lived in our new house. Whether you live in the Highlands or not, I could not recommend higher, the Front Porch Tuesday model. Not only meeting the neighbors, but spending time with them and getting to know them can add so much enjoyment to your life. In just a few short months my next door neighbors have become like family and it is wonderful. We are looking forward to many more Front Porch Tuesdays to come. Please visit our Louisville Highlands Homes for Sale page to learn more about this wonderful part of our city. This weekend you will have the chance to drink all the beer you want while roaming among elephants, lions, and giraffes. The Louisville Zoo’s annual Brew at the Zoo takes place this Saturday August 25th and is sure to be a roaring good time. Bring your lawn chairs or blankets and plant yourself in the large field where the band 100% Poly will be playing 70’s and 80’s inspired music for your entertainment. More than thirty local and regional breweries will be at the Zoo offering many varieties of beer and wine and with your ticket price covering all the beer you can drink, you could potentially try them all! Nearly Forty local restaurants will be offering delicious specialties to indulge your taste buds and help soak up some of that alcohol. For those of you not drinking or for the lucky one that gets to drive home, they will have non-alcoholic options for you. Brew at the Zoo is only open to visitors 21 and over, with no exceptions. Festivities begin Saturday evening at 4:00pm and end at 9:00pm. Individual tickets are $45.00, and designated driver tickets are $30.00. V.I.P tickets are $89.00. Individual ticket prices include the entertainment, all you can drink beer and wine, food, and 5oz mug. VIP ticket extras include a tee shirt, separate entrance to the zoo, VIP tasting glass, access to VIP tent which includes special brews, food, and private restrooms. The VIP ticket pretty much means no lines, easier access to bathrooms and more food. Tickets can be bought online at http://www.louisvillezoo.org/brew. Get your tickets quick because I’m sure its going to sell out. Louisville, and Kentucky as a region has some great beer. Some of the breweries that will be represented at Brew at the Zoo are Against the Grain Brewery, Arcadia Brewery, Boston Beer Company, Bluegrass Brewing Company, Crispin Cider, Brooklyn Brewery, Cumberland Brewery, Dogfish Head Craft Brewed Ales, Falls City Beer, Green Flash Brewing Company, Harpoon Brewery, Left Hand Brewery, Magic Hat Brewing Company, New Albanian Brewing Company, Rogue Ales, Schiner Beers, Thirsty Dog Brewing Company, Upland Brewing Company, and Wyder’s Cider. Some great local restaurants will be serving food at Brew at the Zoo as well. Some of the local fare will be from Kern’s Kitchen, Mark’s Feed Store, RiRa Irish Pub, Roosters, The Irish Rover, The Monkey Wrench, and Za’s Pizza. Menage A Troi, Best Vineyards, 14 hands, Columbia Crest, Primal Roots, Relax, Ruffino, Thorny Rose and Beringer Founder’s Estate will be the Vineyards supplying the wine for the event. There will also be water and local coffee from VINT, Sunergos, and Heine Brothers. Please visit Louisville Homes for Sale for all of your real estate needs in the Louisivlle, KY area. The Summer may be winding down but that doesn’t mean you need to be spending less time outdoors. In fact, I think that these days heading in to the Fall months are some of the best days to plan your outdoor adventures. One of Oldham County’s gems, and a Nationally-recognized center for gardening and horticulture is Yew Dell. If you live in Oldham County or anywhere in the Louisville area, the Yew Dell Botanical Gardens is an excellent place for a day trip where you can bring the whole family or bring a couple of friends and explore some options for your home garden. Yew Dell Botanical Gardens is listed on the National Register of Historic Places and is a Preservation Project of the Garden Conservatory which is a national non-profit that helps preserve the Nation’s most impressive gardens. Yew Dell is full of beautiful gardens and sustainable horticulture. They offer educational programs, display gardens, community events that cater towards families, private event facilities, and ongoing research into new and better gardening plants and techniques. Yew Dell is constantly changing with the times and making sure that they are up to date with the most recent technology. They recently announced that in honor of their 10th anniversary they will be adding a collection of new horticulture facilities. The project will include a new solar/geothermal greenhouse complete with a green roof, plant growing and propagation space, and a teaching and workshop space with room for modest exhibits. There will also be unique production facilities for fall/winter vegetable research evaluation work. Yew Dell plans to build an all-encompassing facility, combining evaluation fields for vegetable and ornamental crops and updated container production facilities. If this is all mumbo jumbo to you, I understand, but the bottom line is that Yew Dell is doing some really cool stuff in the world of gardening and sustainable horticulture and it is right in Oldham County waiting for you to visit. Yew Dell offers ongoing classes and events that will appeal to almost everyone. Saturday August 25 is the Hummingbird Festival at Yew Dell. The Hummingbird Festival will give you the rare opportunity to view hummingbirds up close and learn all about these fascinating birds. There will be kids activities, hummingbird plants for sale, and refreshments available. It is sure to be a unique event and a great time. Sunday August 26 is Children in the Dell. An ongoing class at Yew Dell, this class is open to children ages 5-12 and gives them the opportunity to learn about gardening, the woods, hiking, and everything outdoors, straight from the experts. The class starts at 10:30am and is $5 for members and $10 for non-members. Check with the website, Yew Dell Gardens, for more date and time information. Not only are there many classes available at Yew Dell, but there are a variety of tours and programs too. Yew Dell has so much to offer everyone, even beyond the gardener, chef, outdoorsmen, artist, or eco-friendly builder. It is places like Yew Dell that make Oldham County and the Louisville area such an amazing place to call home. For one day a year, Louisville opens it’s roads and the Ohio River to the fittest and most impressive athletes around. Louisville drivers beware, the roads all around town will be a mess, and travel times will be doubled because this Sunday Louisville will host the 2012 IRONMAN. It will however be all worth the travel troubles, because the IRONMAN is an exciting athletic event that brings with it lots of perks for our city. If you are participating in the IRONMAN, you have known about the impending race for months, and have probably been training for longer than that. The IRONMAN consists of a 2.4 mile swim, a 112 mile bike ride, and a 26.2 mile run. It sounds insane right? I have the utmost respect for the IRONMAN triathletes. Any athlete that can finish the race, let alone come in one of the top finishing places is incredible in my book. There are plenty of places to watch the race and cheer on the athletes. The IRONMAN takes the participants all over the Louisville area, from Downtown Louisville, to LaGrange to South Louisville at Churchill Downs and back to the center of downtown. Competitors begin the race on the banks of the Ohio River with a timed trial swim. The timed trial is a unique feature to the Louisville IRONMAN that is not normally part of other IRONMAN races. Participants will jump in to the river on a first come first serve basis, one by one, to begin their swims. They will exit and begin their transitions at the Great Lawn at the Waterfront. Next is the bike section, which will take the athletes through a scenic ride in Oldham and Henry Counties. Bikers will have to handle sections of rolling hills and flat lands, but will have views of beautiful Kentucky horse farms and neighborhoods to ease the ride. The 26.2 mile run will take the participants through the University of Louisville campus and past Churchill Downs in South Louisville. The finish line will be a celebration filled with cheering fans at Fourth Street Live in the heart of Downtown Louisville. The IRONMAN will offer 50 age group qualifying slots to the 2012 World Championship in Hawaii. That race will take place October 13of this year in Kailau-Kona. The top male and female finishers of that race will share a prize purse of $25,000. Registration is open now for the 2012 Louisville IRONMAN, so if you still need to register, you can go to Louisville IRONMAN. Last year’s Louisville IRONMAN was a terrible reminder, just how dangerous extreme athletics can be. Just 8 minutes into the swim portion of the race, 46-year-old Mark Wezka suffered a heart attack and never regained consciousness. Wezka’s death is a reminder that we should never take our bodies for granted. I love to watch these triathlons, and marvel at the strength and hard work of the athletes involved, but we need to remember the risks associated with the sport as well. Most adult triathletes are smart about their bodies, but for young, up and comers, in a society where being number one is considered best, we might want to start teaching that being healthy and number two might not be so bad. I will be cheering on the Ironmen and Ironwomen this weekend from the comfort of my home and wherever I can walk to. I will be avoiding the streets and suggest you do the same. I suggest using it as an excuse to have a relaxing day at home and leave the hard work to the triathletes for the day. You can learn more about the area at Louisville Real Estate and search for your dream home. We look forward to it every year. We consider the entire field, narrow down our selections and then choose the one we think is best. But we aren’t content to trust just our own instincts. We also ask our friends who they like, and we wonder who the experts will pick. When this time rolls around each year, we can hardly wait to see who wins. And we’re not even talking about the Kentucky Derby! No, each summer Louisville home owners look to see who our town has chosen as this year’s “Best of Louisville” in any number of different categories. The Best of Louisville competition, sponsored by Louisville Magazine, has featured the best of everything around town for 27 years now. But this year, not only did the magazine’s readers and editors have their say, a panel of local experts in the areas under review — music, food, architecture and development — were consulted for their opinions as well. To get the skinny on who finished first in every category, check out the magazine’s July issue. But for the bottom line on some of the best spots in Derby city for dining, we have the winners right here. One of the nation’s top cities for dining out, Louisville boasts hundreds of wonderful, eclectic places to eat. And now that Louisville’s home owners – as well as the experts – have spoken, this year's “best” is a sure bet. Calling all artists, architects, or historic building lovers, we have a contest for you. Old Louisville is looking for a new entrance to mark one of it’s most well-known communities and it’s calling on you to design it. The Fountain Court Design Competition is being sponsored by the South Fourth Street Historic District Neighborhood Association and they are eager to give their entrance an overhaul. Fountain Court appears beyond two large apartment buildings and is home to impressive Victorian homes and apartments. The current entrance in drab and boring, explaining nothing about the vibrancy of the community or the history of the neighborhood. Designers might have a tougher time than they think, as the project is more complex than it seems. The entrance that will be chosen as the winner must be visually appealing while keeping the historical relevance of the area in mind. If you are interested in entering the contest, there are some things you need to know. The contest will happen in two stages. First, you must submit your design qualifications. A short list of designers will be considered and up to three with be chosen to create a concept design for the Fountain Court entrance. Each of these participants will receive $500, and the winning designer will receive an additional $500 with their design coming to life. Now listen up, because this is important, designers must incorporate themes and elements from the historic Southern Exposition that ran from 1883-1887 on the site of St. James and Fountain Courts. For more information on submitting your designs, deadlines or anything else, contact the South Fourth Street Neighborhood Association at www.sfourth.org. Fountain Court is just one of the beautiful walking courts that fill Old Louisville. Belgravia Court and Fountain Court are the two walking courts that hold the largest and most expansive Victorian homes in the neighborhood. St. James Court, although open to both pedestrians and automobiles, epitomizes Old Louisville’s architecture and history. The Conrad-Caldwell House and “The Pink Palace” are two well-known and immaculate Victorian homes built in 1908 and 1891 respectively. The Conrad-Caldwell House was a residence and now a museum, while the “Pink Palace” used to be Old Louisville’s gentleman’s club and casino. Pedestrian courts and their history add to Old Louisville’s uniqueness. These courts were originally designed to add to the city’s park-like setting. Within an urban setting, green space is abundant. Once you walk into one of the courts, serenity ensues. The courts, including St. James, offer a special way of living that is unique to Louisville. The magnificent architecture, historical mansions and tree-lined streets and gardens make Old Louisville a special place to live or visit. In Old Louisville you will find the largest assembly of Victorian mansions in the Country. 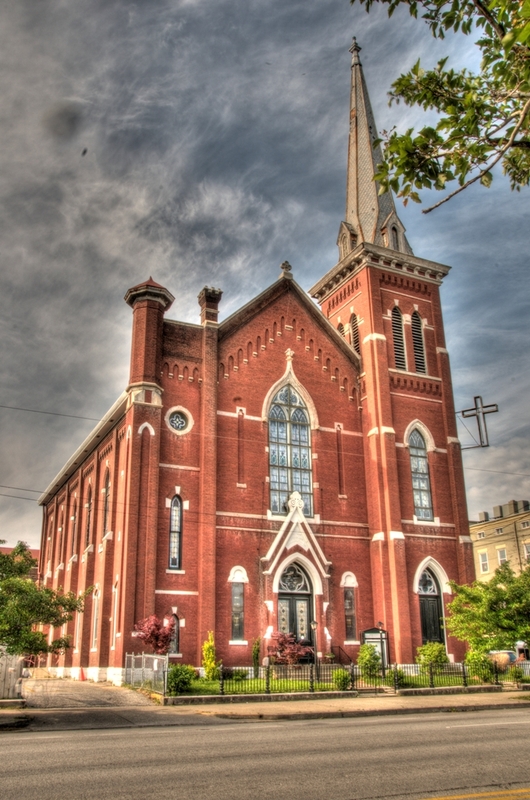 Other styles of homes in Old Louisville include Italianate, Renaissance Revival/Georgian Revival, Richardsonian Romanesque, Queen Anne, Tudor, Beaux Arts, and many more. If you are like me you love a good night out of Jazz music and cocktails. Until recently, I thought Louisville was devoid of any real Jazz and a stable Jazz music community, and boy was I wrong. I realized that I was looking in all the wrong places. Both the University of Louisville and Bellarmine have amazing Jazz programs that produce excellent young musicians. The artists that come out of these programs entertain audiences throughout Louisville. After The Jazz Factory closed it’s doors in 2008, the Louisville Jazz community was left with no home for Jazz nightlife. Jazz music now, is heard mainly in restaurants, bars, the radio, and at special events. No matter what day of the week, you can usually find some good Jazz music somewhere in the city if you know where to look. The Louisville Jazz Society’s website is very helpful, and I suggest you check it out before making dinner reservations. Restaurants that regularly have live Jazz music include, Varanese, Vincenzo’s, Mozz, Jack Fry’s, and Eddie Merlot’s Steakhouse. VoJazz, Bobby Faulk Group, Jeff Sherman Trio, and Steve Crews Solos are just some of the many acts that perform on a weekly basis around town. Live music adds so much to a night out, whether it is a dinner, drinks, or a show in a club. I love that Louisville’s Jazz community is thriving but I still wish we had a nightclub dedicated to Jazz music and even the blues as well. Louisville has a rich history with Jazz and Jazz clubs, and it would be nice to bring that history back to life. Foxhollow Farm…Support Your Local Farmer! As the Summer winds down and the school year is beginning, my family is hurrying to finish our list of Summer to-do’s and outside adventures. My husband and I are ripping up our brick patio and getting ready to put down a wood deck, enlisting help from the neighborhood kids. All the parents in the neighborhood love us because their children all sleeping soundly from hauling load after load of bricks from one end of our backyard to another. Other end of summer activities include a canoe trip this weekend and a trip to Foxhollow Farm. Foxhollow Farm is located in Crestwood, Kentucky which is in Northeast Louisville in Oldham County. Crestwood is full of farmland, but the Foxhollow Farm is unique. The farm is made up of 1,300 acres of farmland and woods that is open to the public. There are guided tours for groups or families, or the hiking trails can be walked at your leisure. You can also have the opportunity to tour the land with the farm’s proprietor to learn about the farm’s bio-dynamic agriculture straight from the person who set it all up. Hayrides and private lessons such as canning are also available at the farm. Foxhollow believes in bio-dynamic agriculture. For those of you who don’t know what that means, bio-dynamic agriculture is a lot like organic farming, but takes it a step further. Both organic and bio-dynamic methods wont use chemical fertilizers or pesticides in the production of their produce. Foxhollow raises cows and sells grass-fed beef. The cows eat high quality grass with no pesticides and the farm uses no antibiotics or growth hormones. Bio-dynamics, like the method used at Foxhollow Farm takes organic farming even a step further, and uses prepared sprays made from organic matter such as compost, herbs, and quartz crystal. These sprays bring nutrients to the soil and increase sustainability on the farm. I learned a lot more information about grass fed beef, while researching Foxhollow Farm that I never knew before. Foxhollow believes in grass-fed beef’s heath benefits over grain-fed beef. Some of these benefits are that grass fed beef is lower in calories and saturated fat, higher in Viatmin A, Vitamin E, Omega 3 Fatty Acids, and Protein. I always knew that grass-fed beef was tastier, but I was unaware that it was healthier. Aside from the bio-dynamic aspect to the farm, Foxhollow is a great place to go and explore on a nice day. Whether you want to take the kids to run around, or if you just want to get some fresh air, Foxhollow is a beautiful place to get out relax, and get some great produce. Take a walk by the garden, hike through the walking trails, or make a picnic in the field, spend the day outdoors. There is a café and grocery store so you can stay for lunch and load up on some local seasonal produce. Don’t forget about Foxhollow around Halloween time, they will have bio-dynamic pumpkins! Support your local farmer, and remember that local produce is the best and most delicious produce there is! One of the things that makes Louisville such an amazing city is it’s rich diversity. Walking down Bardstown Road in the Highlands you see people from all walks of life mingling together in a web of socio- economic, racial, and preferential differences. It is hard for many to believe that a city in the middle of Kentucky can be so open-minded, artistically driven, and full of talent. Of course, like any big city, there are those people who spoil the overall attitude, but on the whole, Louisville is a progressive town. This weekend is proof that we are all moving forward in that we are happy to be hosting the LGBT Film Festival. For the second year in a row the Louisville will be hosting the Festival August 16th through August 19th. Last year, the festival was held at the Clifton Center, but it has since outgrown it’s old home and moved to the University of Louisville campus. Over 100 Films were screened for this years festival, ensuring that the films picked for the three day festival will not disappoint the viewers. The festival will include 48 films that somehow incorporate being or being affected by being gay, transgender, bisexual, or lesbian. This year’s festival has several special guests, including country music singer Chely Wright. Wright appears in “Wish Me Away,” a documentary about her coming out as a lesbian in 2010. Wright will also stay for a question and answer session after the screening of the film on Sunday at 2pm. Wright has been open in the past about her struggles with coming out as a gay woman and the hardships she has faced because of it. The documentary is sure to be a raw and candid look into her life that many people will be able to relate to. Wright is not the only star that is coming to the festival, Natalie West stars in the feature film “Nate and Margaret” and will be at the festival answering questions along with her co-star Tyler Ross, after the screening. West is most well known for her role as Crystal Anderson-Connor on Roseanne. There will be six, two-hour sessions a day of films at the festival this weekend for a total of 18 sessions. The LGBT Film Festival has grown incredibly since last year, and the audience is responding extremely positively according to LGBT officers. There will be a kick-off party for those interested, Thursday the16th from 7pm-11pm at Red Barn which is located on the University of Louisville campus. The party is Prohibition themed, so 1920’s costumes are recommended and jazz music and old fashioneds can be expected. Weekend passes to the films and Question and answer sessions are $30 dollars or $15 for students. There are a limited number of VIP tickets left that can get you in to a meet and greet with Chely Wright that is happening Saturday at 7:30pm. For more information go to louisvillelgbtfilmfest.com or their Facebook page http://www.facebook.com/pages/Louisville-LGBT-Film-Festival.